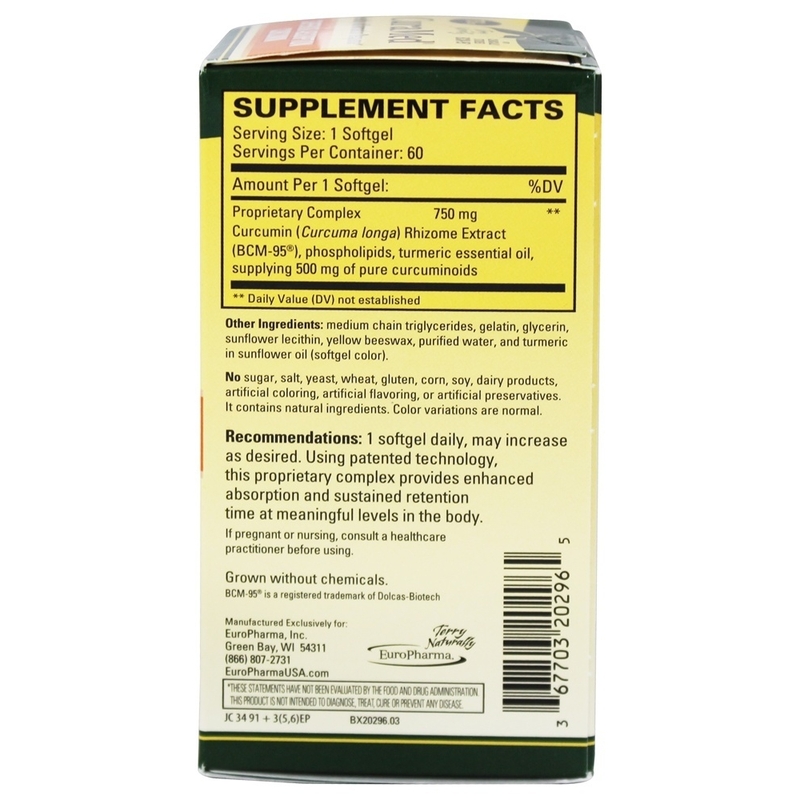 Plain curcumin 95% compared to turmeric delivers 20 to 50 times the curcumin as the same amount of turmeric. EuroPharma Terry Naturally Cura Med supports healthy inflammation response and is equivalent up to 10 capsules of plain curcumin. 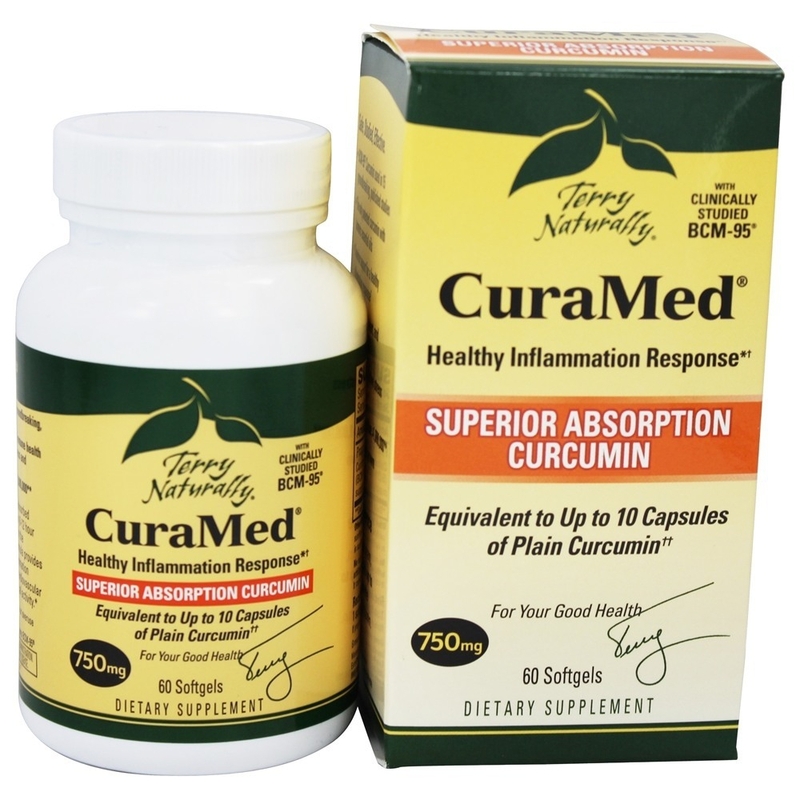 CuraMed is up to 10 times better absorbed than standard curcumin, and has an 8-12 hour retention time at significant levels in the bloodstream. this high-potency formula provides superior support for a healthy inflammation response, a healthy immune and cardiovascular system, and resistance to free radical activity. Proprietary Complex: Curcumin (Curcuma longa) Micronized Rhizome Extract (BCM- 95), phospholipids, turmeric essential oil, supplying of pure curcuminoids. 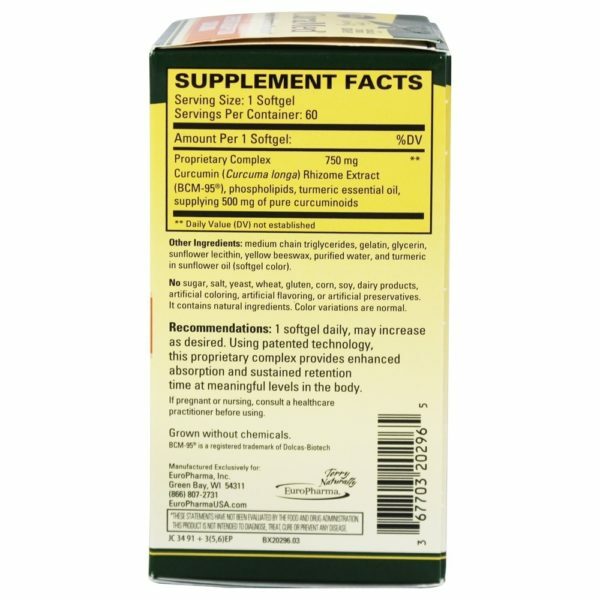 Other Ingredients: medium chain triglycerides, gelatin, glycerin, high phosphatidylcholine lecithin, yellow beeswax, purified water, hydroxylated lecithin, and turmeric in sunflower oil (softgel color). Contains Soy (less than 5 parts per million Curcumin Contains no: sugar, salt, yeast, wheat, gluten, corn, dairy, artificial coloring, artificial flavoring, no preservatives. It contains only natural ingredients. Color variations are normal.